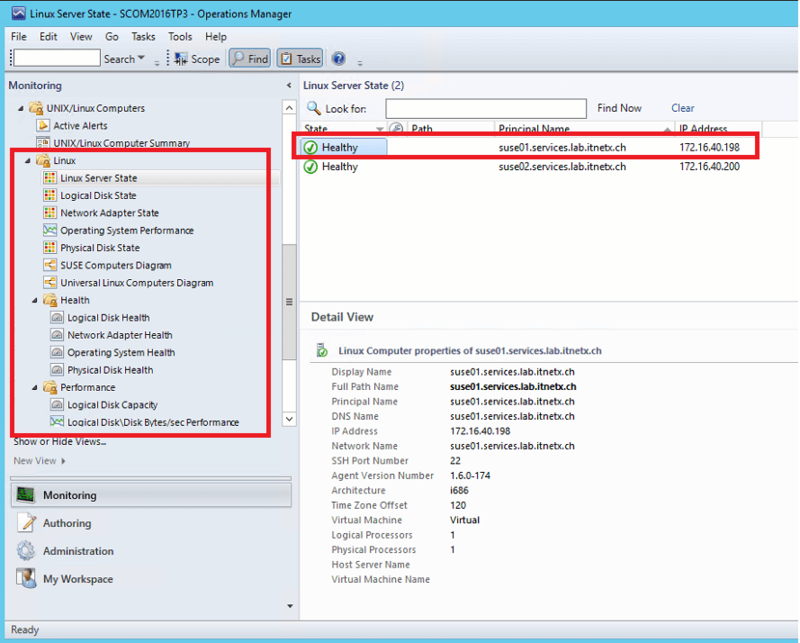 Few month ago, Microsoft released management packs for monitoring open source software like Apache HTTP Server or MySQL databases. 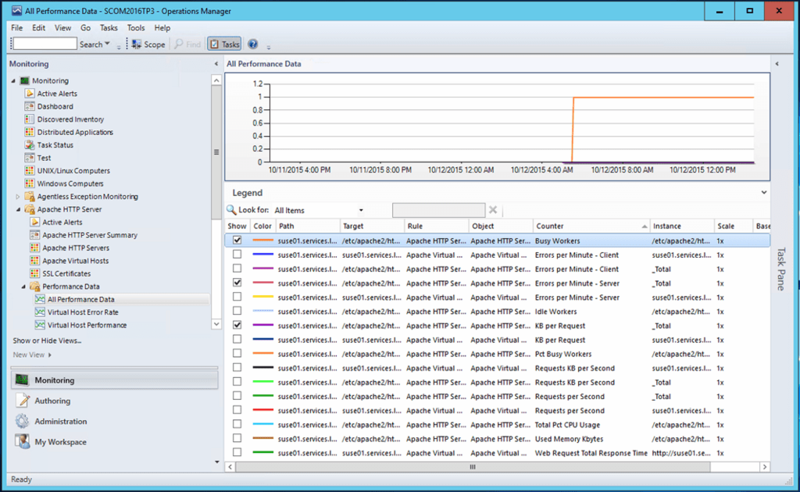 In this post I would like to have an overview of monitoring Apache web server. So far there have not been many free options to actually monitor this web server, although it is a very common candidate out in the field. 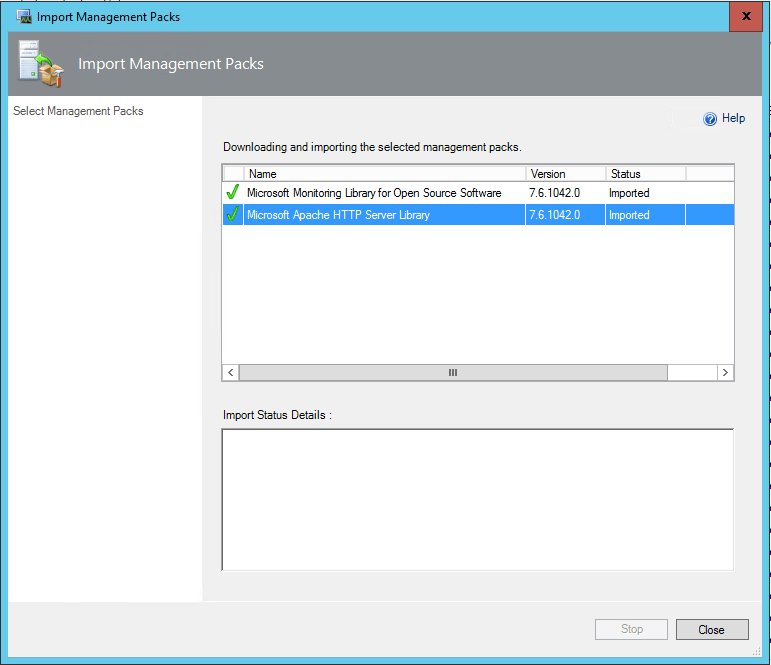 This management pack shows clearly Microsoft’s commitment to support open-source software in the SCOM world. 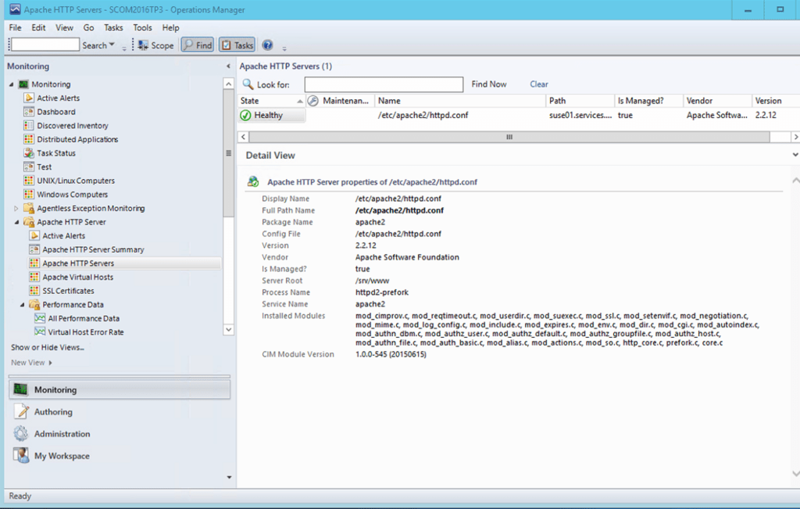 This current management pack supports version Apache HTTP Server version 2.2 and 2.4 if you install Apache from one of the SCOM supported Linux distributions. Find all supported *nix versions here https://technet.microsoft.com/en-us/library/hh212713.aspx . 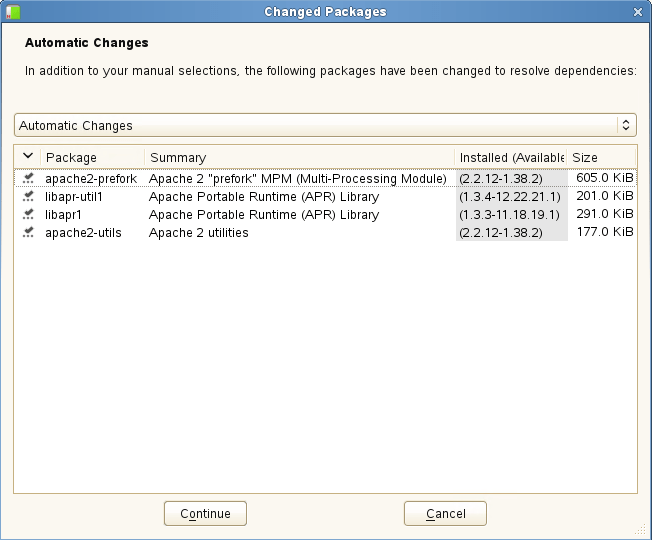 In SUSE Linux Enterprise Server 11 there is Apache version 2.2 and in SUSE Linux Enterprise Server 12 there is Apache version 2.4 included. 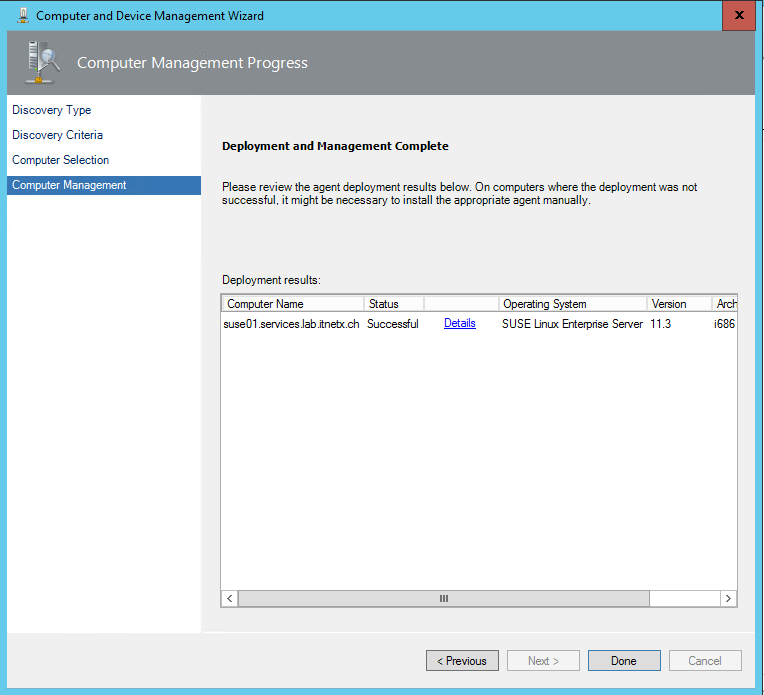 In this example I installed SUSE Enterprise Server 11 SP3. 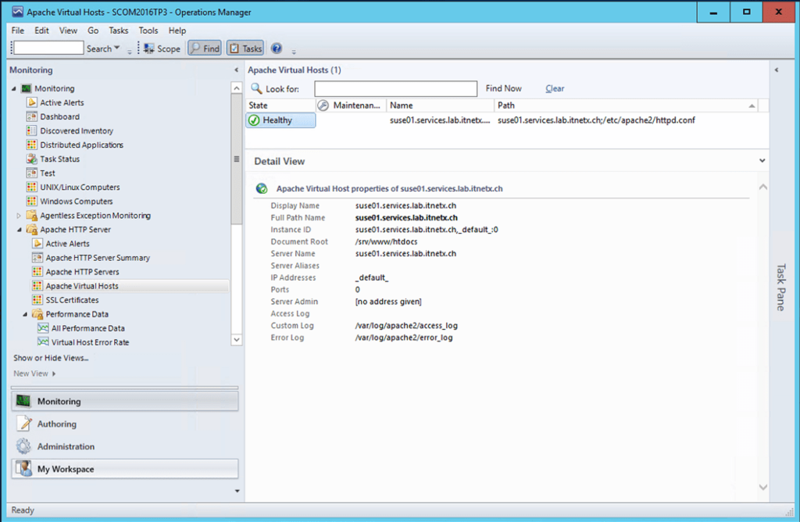 The Apache management pack is part of the System Center 2016 Technical Preview 2 Management Packs for Open Source Software found here http://www.microsoft.com/en-us/download/details.aspx?id=46924 . 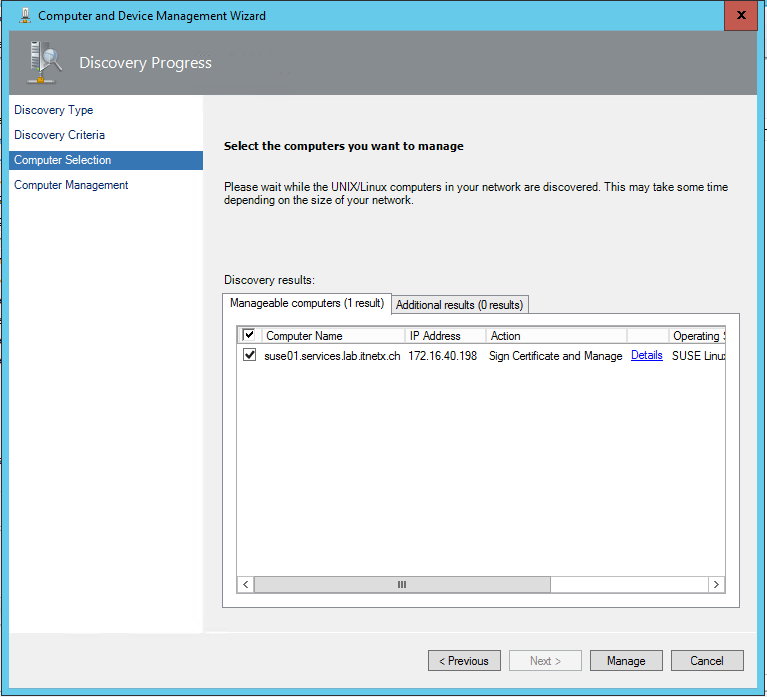 Required is at least SCOM 2016 TP2, but SCOM TP2 has already expired few month ago, I will use SCOM 2016 TP3, which also works perfectly fine and can be found here https://technet.microsoft.com/en-gb/evalcenter/dn781241 . You might are used to have *.rpm or *.deb files in this directory, in this current version Microsoft delivers a *.sh package we need to extract later on. 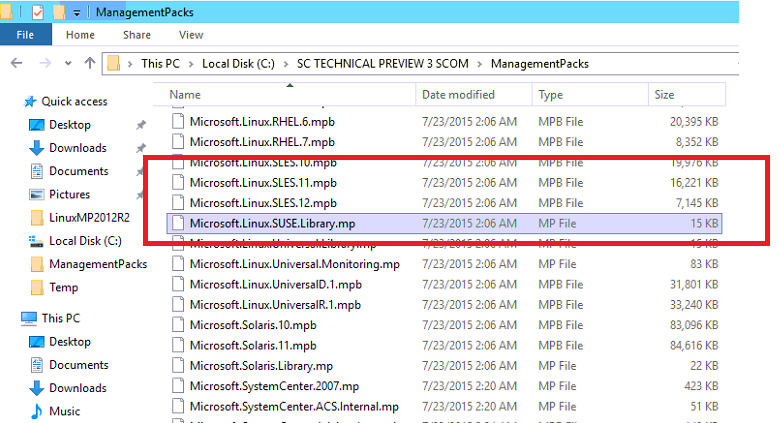 Because these are no installer file, I could not use the SCOM agent wizard to deploy these packages. So we need to take some manual steps to install the agent. 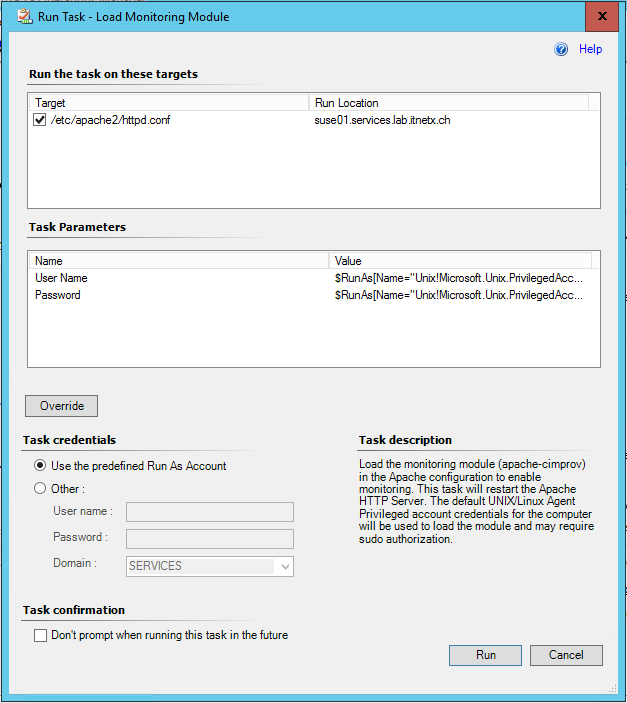 Before we proceed make sure you have configured your Linux monitoring RunAs accounts properly. 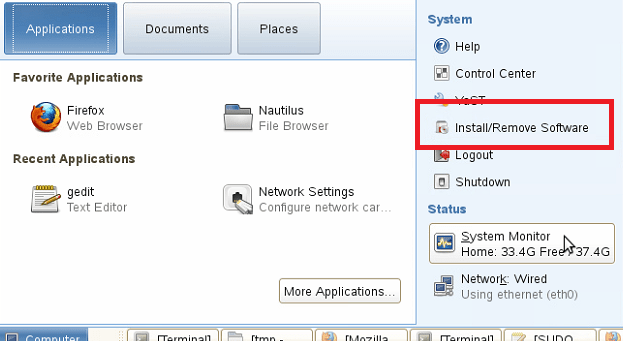 Please read this post for more details on how to configure the RunAs accounts http://stefanroth.net/2012/03/15/scom-2012-linux-monitoring-lab-part-1-setup-suse-11-1/ , it shows you exactly how to monitor a Linux server. 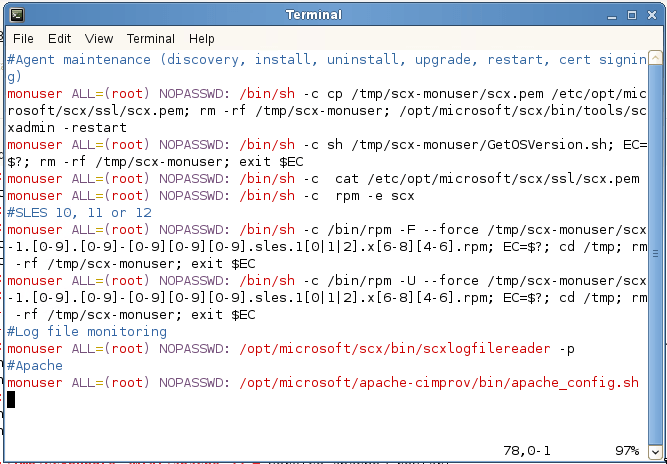 At this stage you should have the proper Linux distribution MP’s imported, RunAs accounts configured and also the agent source file scx-1.6.0-174.sles.11.x86.sh copied to the Linux server. 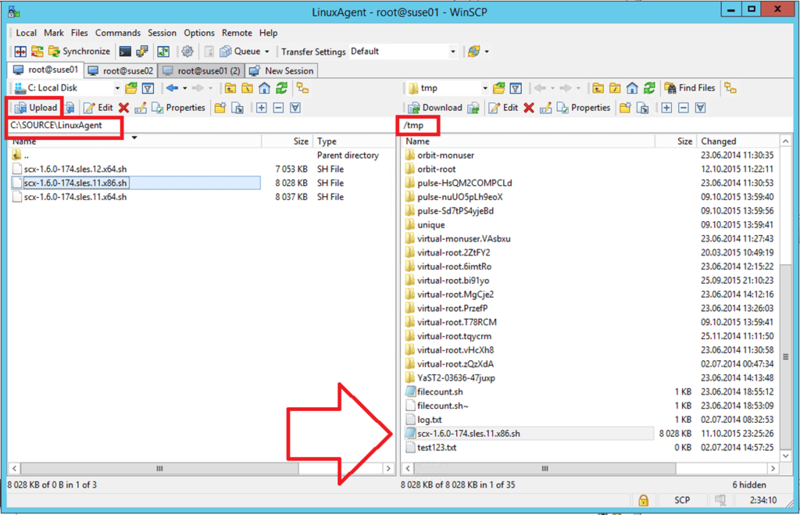 Note: We imported these management packs first, because this will place the agent file into the C:\Program Files\Microsoft System Center 2012 R2\Operations Manager\Server\AgentManagement\UnixAgents\DownloadedKits on your SCOM server, which is needed to install the agent. At this point you should have the Linux server monitored and if this is ok we will take the next step and install the Apache HTTP Server. 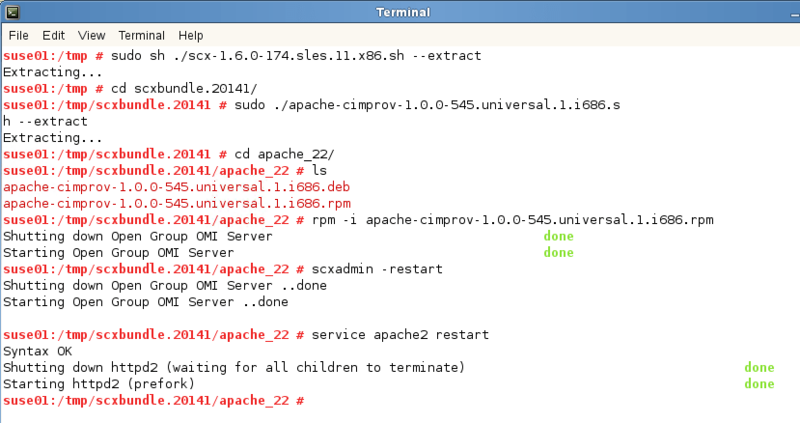 At this stage we have Apache HTTP server installed and running. 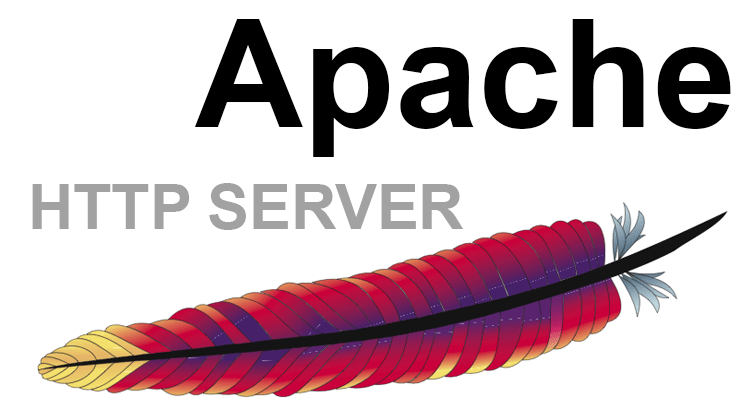 There are multiple steps you need to take to monitor Apache HTTP Server. First monitor the basic Linux OS, if Apache has not been installed before, you need to install the CIM Provider afterwards. 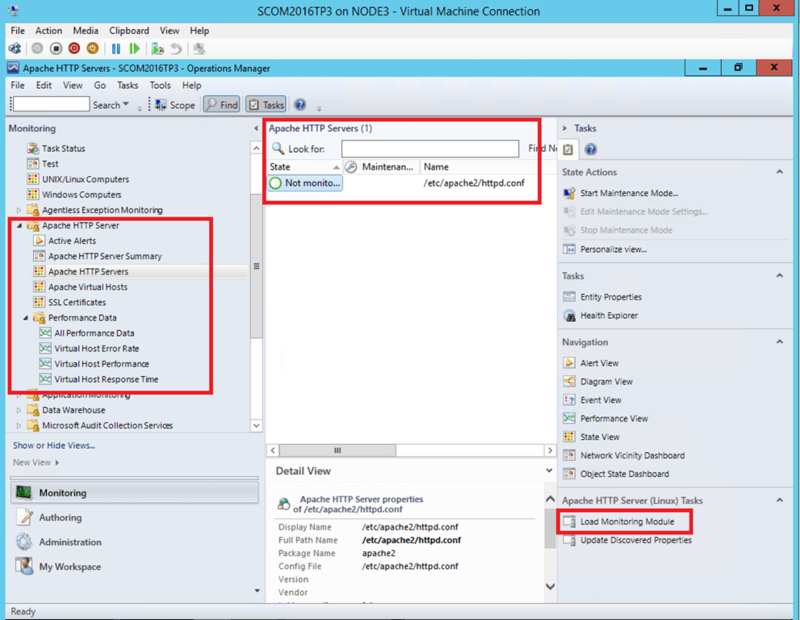 For monitoring Apache HTTP Server import the Apache MP’s and load the module apache-cimprov into the web server by executing the Load Monitoring Module SCOM task. At the end you get a pretty well monitored Apache HTTP Server having the most common performance counters out of the box. Be aware the discoveries run every 4 hours and the rule collect data every 5 minutes. 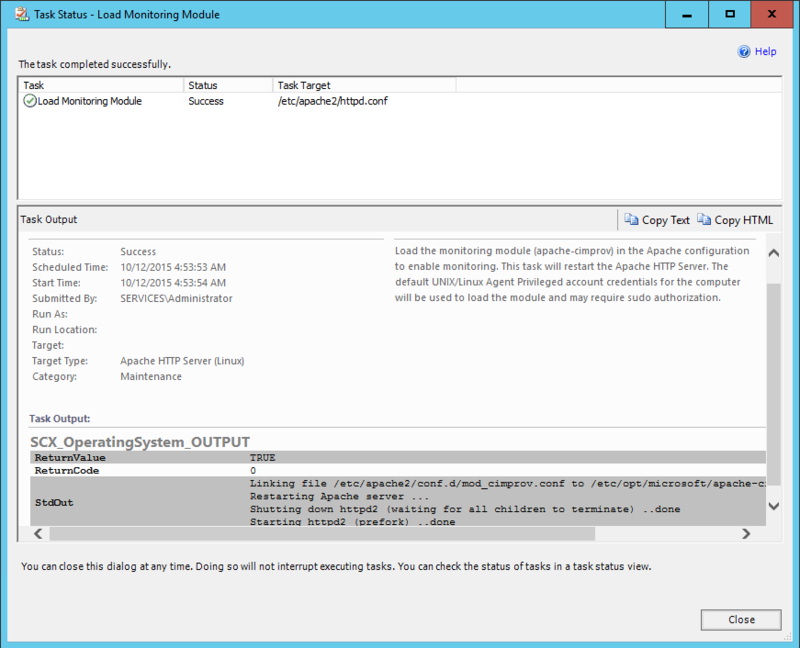 If you need to know what exactly is being monitored and which data is collected read the MP guide provided here http://www.microsoft.com/en-us/download/details.aspx?id=46924 . The intention here was to play around with the Apache monitoring and therefore this procedure might does not exactly meet the production requirements. I hope you get an impression how things play together.